Hey, I run an automation script across multiple FTP Sites and have had no issues until one weekend one of the three shows /'s before and after each folder as well as full path for folders and files. This is causing issues with downloading files as the path cannot be found. When I use the Copy to Clipboard (Include Path) I get /EDI/Emdeon/2014/NewFiles//EDI/Emdeon/2014/NewFiles/m837.20141208.POD4.05143. The actual path is /EDI/Emdeon/2014/NewFiles/m837.20141208.POD4.05143. I've checked with the FTP Server and they say it looks fine from their side. Filezilla also shows no /folder/ names. Any idea how to get WinSCP to recognize file and folder names as the other sessions do? // ME - Connection part removed.
. 2014-12-12 11:05:35.395 Using SFTP protocol.
. 2014-12-12 11:05:35.395 Doing startup conversation with host.
. 2014-12-12 11:05:35.515 SFTP version 3 negotiated. // ME - /EDI/Emdeon/2014 is the remembered last used directory.
. 2014-12-12 11:05:35.545 Changing directory to "/EDI/Emdeon/2014".
. 2014-12-12 11:05:35.615 Trying to open directory "/EDI/Emdeon/2014".
. 2014-12-12 11:05:35.685 Getting current directory name.
. 2014-12-12 11:05:35.845 Listing directory "/EDI/Emdeon/2014".
. 2014-12-12 11:05:36.145 Startup conversation with host finished. // ME - Tried changing to a 'blank' directory in the directory tree pane.
. 2014-12-12 11:05:41.834 Changing directory to "/EDI/Emdeon/2014//EDI/Emdeon/2014/Archive/". * 2014-12-12 11:05:41.914 (ECommand) Error changing directory to '/EDI/Emdeon/2014//EDI/Emdeon/2014/Archive/'. * 2014-12-12 11:05:41.914 Cannot get real path for '/EDI/Emdeon/2014//EDI/Emdeon/2014/Archive/'. * 2014-12-12 11:05:41.914 No such file or directory. // ME - Tried changing to the other 'blank' directory in the directory tree pane.
. 2014-12-12 11:05:44.147 Changing directory to "/EDI/Emdeon/2014//EDI/Emdeon/2014/NewFiles/". * 2014-12-12 11:05:44.227 (ECommand) Error changing directory to '/EDI/Emdeon/2014//EDI/Emdeon/2014/NewFiles/'. * 2014-12-12 11:05:44.227 Cannot get real path for '/EDI/Emdeon/2014//EDI/Emdeon/2014/NewFiles/'. * 2014-12-12 11:05:44.227 No such file or directory. 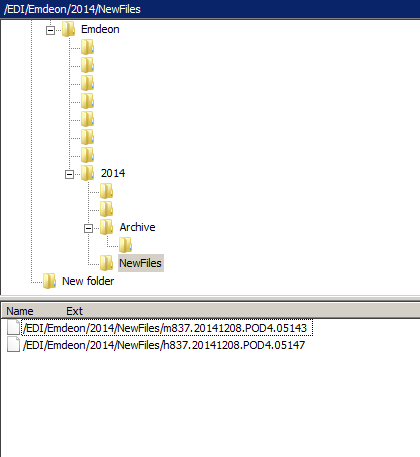 // ME - Used File List pane to change into the NewFiles folder (note: Folder shows as "/EDI/Emdeon/2014/NewFiles/"
. 2014-12-12 11:05:45.768 Cached directory change via "/EDI/Emdeon/2014/NewFiles/" to "/EDI/Emdeon/2014/NewFiles".
. 2014-12-12 11:05:45.768 Getting current directory name.
. 2014-12-12 11:05:45.768 Listing directory "/EDI/Emdeon/2014/NewFiles". // ME - NewFiles has two files in it, in the File pane they show as "/EDI/Emdeon/2014/NewFiles/h837.20141211.POD4.05173" and not as just "h837.20141211.POD4.05173"
. 2014-12-12 11:05:54.154 Closing connection. So it's SFTP server, not FTP. Your SFTP server seems to use full path to a file in directory listing, instead of name-only, what violates the specification. That confuses WinSCP. What is your SFTP server? (You have removed that important information from the log). Hey - Here's the removed connections. Since I don't own/manage this server I've removed Host and usernames.
. 2014-12-12 11:05:33.737 Looking up host "[Removed]"
! 2014-12-12 11:05:34.932 Using username "[Removed]".
. 2014-12-12 11:05:35.092 Using stored password. It looks like some custom-built server. Well, the server clearly violates the specification. And as it does not seem to be widely used, it's not worth investing to workaround on client-side. I'm sorry.